The Capri Skirt pattern is the pattern you’ve been waiting for. Flouncy, bold, stylish—this skirt has it all! And best of all? It’s easy to crochet. 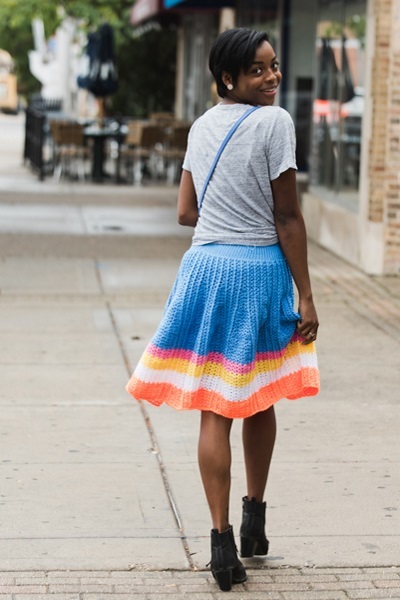 The Capri Skirt looks as bright and fun as a summer day in the pattern colors shown. But change the color, and it’s a whole new vibe! A navy background with neutral stripes gives this skirt a more tailored look. Or work it up in earth tones for fall. Make some of the stripes wider or skinnier, if you like. This pattern is very versatile, so make it your own! Not only is the pattern adaptable, but the Capri Skirt looks great worn many different ways. In the warm months, pair it with sandals and a simple tee. When it’s chilly, add a pair of leggings, boots, and a short jacket. This skirt layers beautifully, so it knows no season. This pattern is worked all on one piece, from the top down in rows for the waistband and in rounds for the skirt. The comfortably stretchy waistband ranges in size from 26” to 42”. The combination of stitches, including front post double crochet, v-stitch, and crab stitch, creates vertical lines that resemble stitched-down pleats. The interplay of the vertical lines with the horizontal stripes is a great design. 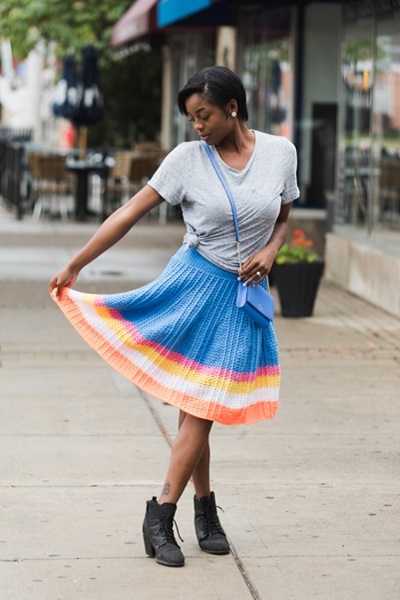 Sonja Otto designed this flirty skirt for I Like Crochet. She started crocheting clothes for her daughter’s dolls, but now designs skirts, shawls, wraps, accessories and more for grown-ups. All Sonja’s patterns have exquisite feminine touches you’ll appreciate. Wear the Capri Skirt out shopping, to lunch with friends, on a date, or anytime you want your personal style to shine. Your friends will be so impressed with your look and your crochet skills—no need to tell them how easy it was to make. You’ll find this pattern in the I Like Crochet pattern library. And, did you know you can have access to it anywhere you go? Just become a Gold Club Member, and you’ll be able to view this charming scarf pattern on your desktop, laptop or tablet – whichever device you prefer! Of course, when you become a Gold Club member, you’ll also get instant access to stitch tips and tutorials, and—oh yes—hundreds of patterns for everything from amigurumi and afghans to scarves and shawls! And don’t forget the best part—you can take all of it with you wherever you want to crochet – on the sofa, at the park, on a plane or train … it’s up to you!